Anyway, a quick glance around the house & I notice there are white iPhone chargers everywhere.Big ones, old ones& now a new one that is not compatible with my iPad or nano.So, given I'm moving my phone from room to room, charging my battery most of the day in any free plug I can find in the house, I thought I better distinguish the old from the new. 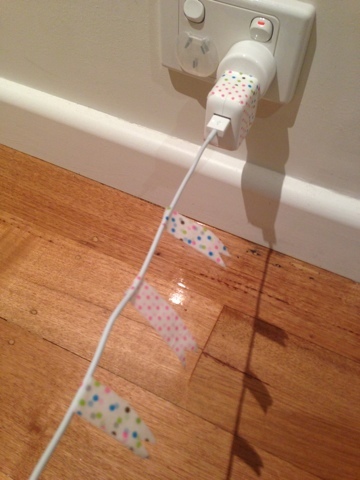 So, here is my new iPhone 5 charger with some bunting attached!! !